While we waste resources, effort, capital, human life, and global good will on King Bush the Idiot's6 Afghanistan and Iraq War debacles, wars of a different type are heating up (literally). Economic wars and the weapon of choice for the initial skirmish is low cost solar panels used for capturing and transforming our sun's energy. It seems China has made an economic bet that its infinite low cost labor force can deliver tennis shoe like scales of economies to the manufacture of solar panels—they may be right1. Regardless, of the merits or eventual outcome of the inevitable "dumping litigation" China's leadership deserves huge credit for advancing the bet, debate, and global competition in a sustainable living market. Of course there is spectacular and supreme irony in wannabe capitalists complaining of being out competed by aspiring socialists2! "...In short, due to the risk entailed, private sector investment will often be unavailable to assist in crossing either of these important developmental gaps [risk to initial capital; risk of market utility, viability and scalability or lack thereof]. In the case of basic research, market payoffs are usually well over a decade in the future, and may not exist at all. In the case of proving scalability, the size of the investment required is often large and the results uncertain. But in spite of these considerations, the development of new energy sources remains of critical importance to the nation…hence means of overcoming them must be found. Markets as opposed to "mythical free markets" are tools—like all tools they must be used correctly, have limits that must be understood to avoid injury, and will frequently fail when used improperly. UPDATED 10/27/2009 White House Blog, The Smart Grid: Creating Jobs, Saving Energy and Cutting Electric Bills. How wonderful to see our President visiting and promoting a small (75 25MWt) but very important Florida Desoto solar farm—converting approximately 75 25 units of thermal solar energy to about 25 8 units of electricity. Much tough work (jobs) remains in the area of increasing a 30% conversion efficiency3, significantly above state of the art; reduction of transmission lose; improved local and distance electricity storage; and grid infrastructure development and roll-out. What a fantastic beginning. It should be noted that photovoltaic (pv) material can be used in forming arbitrary shapes and designs (e.g.roof, rock, sign, fence)—here a rectangular flat-panel is used to maximize the panel area and thus solar flux input as it tracks the sun's arc across the sky. Manufacturing solar panels is capital-intensive and installation of the panels is labor-intensive. However, our unstable, unfit, unwell, and unbalanced "new" alt-white-house et al. is likely more focused on its emotional fan-base than analytical economics. The foolish tariff will increase the price of domestic solar panels and do nothing to assuage any emotional belief that global traders are taking unfair advantage of America. Thank you President Obama, your early leadership in shifting our energy production possibility frontier, amid caustic and continuous criticism, has enabled our current and future competitiveness in this sector, in spite of a small residual nostalgia for our 1920-1970 coal mines. It's worth noting that President Obama provided yesterday's leadership, which today enables Ida (and our nation) to go solar! Our nation and next president must continued to upgrade or replace our decaying and obsolete energy infrastructure. UPDATED 01/24/2014 ThomsonReuters, China's solar industry rebounds, but will boom-bust cycle repeat? Net-zero living structures' instrumentation, sensors and microgrid connections are being inspected and approved before the October 03 start date. A dip in natural gas prices should be viewed as a welcome event that may temporarily ease the CO2 loads5 while we continue to investigate and invest in a diverse set of renewable energy alternatives, including a mix of solar panel concepts and designs. UPDATED 05/29/2012 UPI, White House defends backing Solyndra loan Our president's critics are beginning to sound a bit like a nagging spouse or significant other. Our nation must continue investing in alternative energy, including to drive down the still relatively high cost solar alternatives. As solar panel efficiency, price per kilowatt hour, and battery energy density improves our Flat Earth Society will call clean energy a great American "free market" triumph. UPDATED 07/21/2010 UPI, Oregon first in solar nanotechnology. 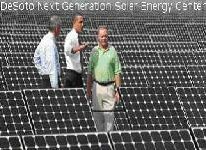 UPDATED 06/02/2010 UPI Pictures, Obama tours solar panel company in [Fremont,] California. Solyndra's CEO Chris Gronet takes our versatile President and first marketeer in chief on a tour of the company's solar panel fabrication facility located in Fremont, California. Kudos to our amazing President for whom no issue or problem, related to rebuilding America seems too big or too small. UPDATED 10/27/2009 WP Transcript, President Obama delivers remarks at solar energy center. UPDATED 10/27/2009 CSM, Obama awards $3.4 billion in ’smart grid’ grants. UPDATED 09/09/2009 Reuters, Google plans new mirror for cheaper solar power. Amazement on Herculean scales and very Google like, if achieved! 1. If a manufacturer (in this case an entire country) thinks it has a comparative advantage in a particular area and that the economies of scale are expected to be large enough to drive marginal costs to near zero it may initially invest huge sums to capture that market. Once the market is captured it can recoup its initial investment and accumulated economic losses. The risk is that you miscalculate and do not capture the market or achieve the expected scales of economies or your competitors out compete you. 3. As we "unwind" (cleanup) the financial schemes (mess) on Wall Street perhaps our physicists can get back to work doing physics instead of wowing hedge fund gamblers. An unfortunate result of running the financial schemes is that it distorts the economy—it's as if everybody suddenly became casino dealers for the gamblers and the people who service them. Makes its more difficult or impossible to find anybody to help run your farm—at least until the house of cards (casino) collapses. 4. Free enterprise, free enterprise markets and government involvements in markets are distinct concepts and differ from "free markets". Whatever meaning Augustine has assigned to these terms it's the antithesis of a panacea for government involvement since he's specifically calling for government involvement. 5. Methane produce significantly less CO2 than equivalent coal combustion. However, methane's GHG gains relative to coal may be partially or totally offset by the quantity of methane that leaks during the live cycle of a natural gas well. Continuous and accurate data (currently unavailable) on methane leakage during the live cycle of a natural gas well are required to determine the net CO2 accounting. 6. UPDATED 01/17/2017 NewYorker (Satire), Bush Counting Down Days Until He Is No Longer Worst President In History.